The pace of crafting has slowed down somewhat over here. My ME/CFS has gone downhill in recent months so my energy levels are pretty low now and I can only manage a limited amount of things on any given day. 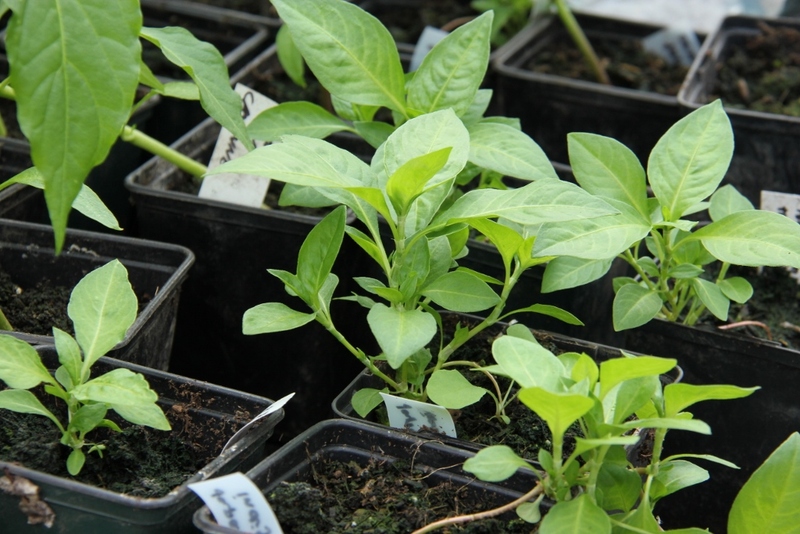 Also, as it is such a busy time of the year in the garden, whatever energy I do have has been spent there. But I am nevertheless managing to do a bit of knitting in the evenings and some slow progress is being made on various other fronts. But rather than wait for some finished and complete work to show you, today I thought I’d go on a hunt with my camera looking for some evidence of whatever Works-In-Progress there are. Here’s what I found during my hunt. 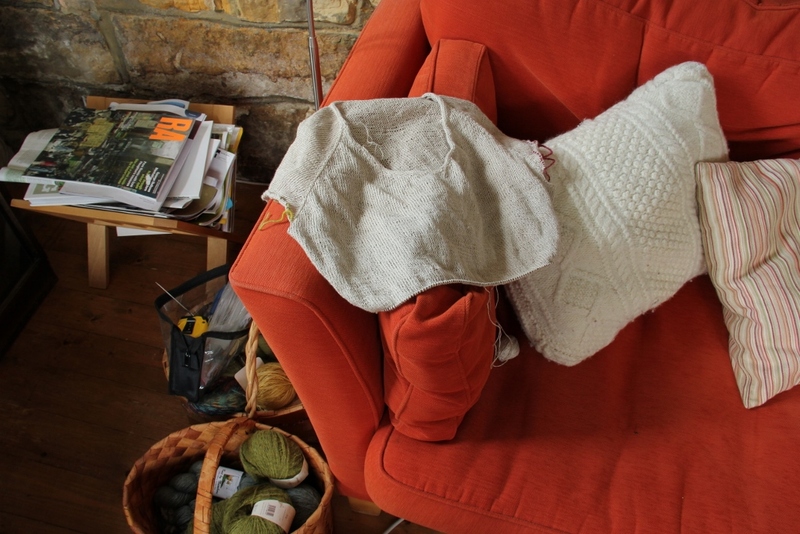 On the living room sofa I found a knitting WIP, a V-necked raglan sleeved T-shirt from undyed linen yarn. I started this last summer, but it has recently come our of its winter hibernation. 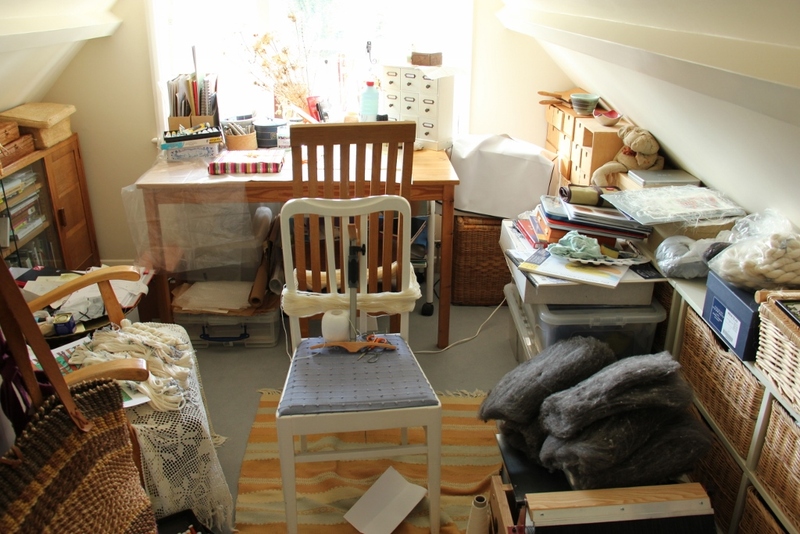 This is where I am currently making lots and lots of small skeins for the summer dyeing season. This is my current carding/spinning WIP. 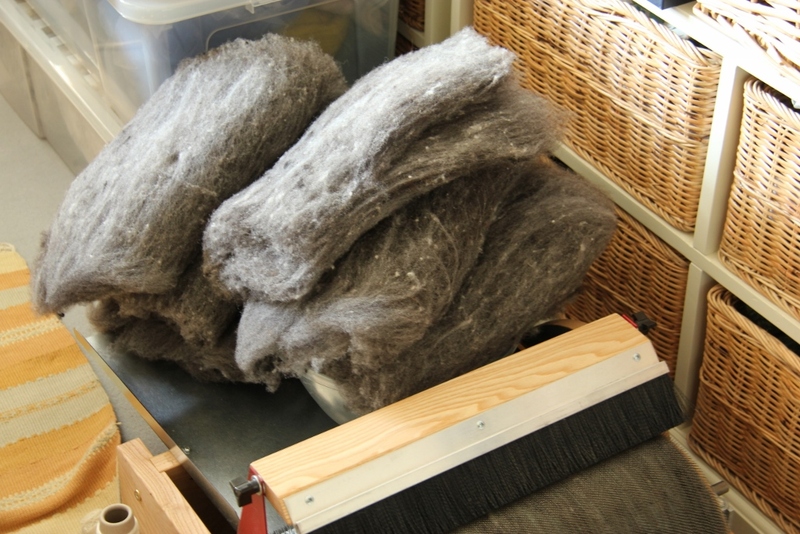 I have been blending Shetland wool in various shades of grey, the next step is to blend it with some angora wool. Eventually, hopefully by next winter, it will be turned into a beanie and gloves for hubby. A few other random things can be found here, for example the results of my silk “paper” making experiment (although I don’t know if it counts as paper given the number of holes in it, but I still like the texture). And here I have been practising different kinds of embroidery stitches in different kinds of yarns. I started making them very even and neat, but soon I felt I had to abandon such neatness and start playing around, varying the width and length and the overall shape. Moving on to the garden, here’s my new pride and joy, a brand new border for my dyeing plants. 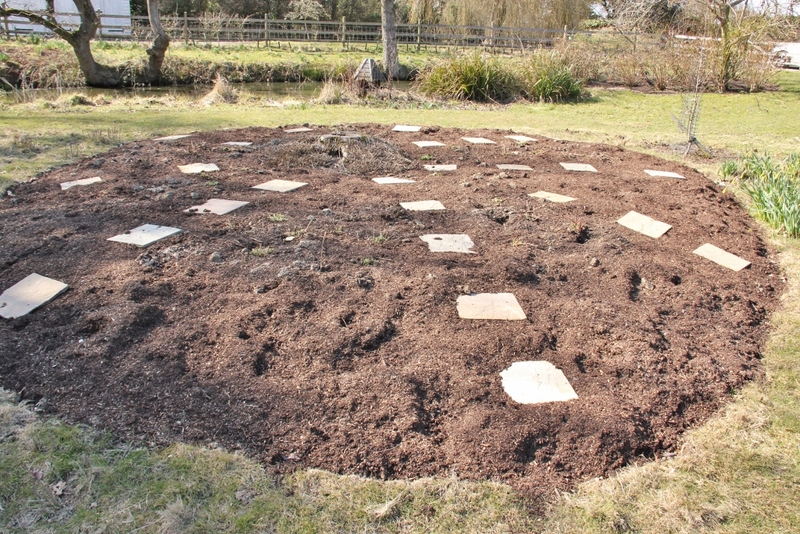 As I need to be able to walk around there to gather the plants, I’ve put some pavings slabs in the middle as stepping stones. 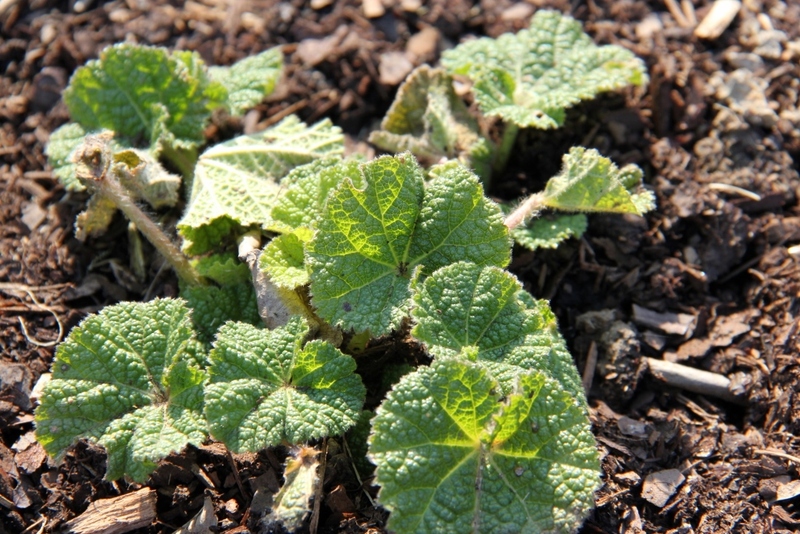 My black hollyhock plants that I grew last year are already growing in the new border, being biennial they should flower this year. I am so looking forward to seeing what kinds of colours I will be able to get from it. 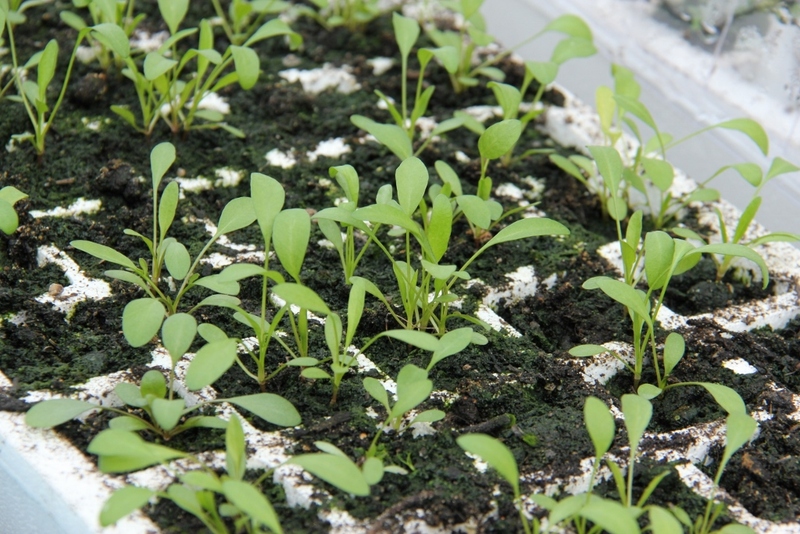 But my Japanese indigo is doing well, even if only less than half of the seeds germinated and initially the seedlings were very thin and leggy as they didn’t get quite enough light on the windowsill back in March when we had very little sunshine. 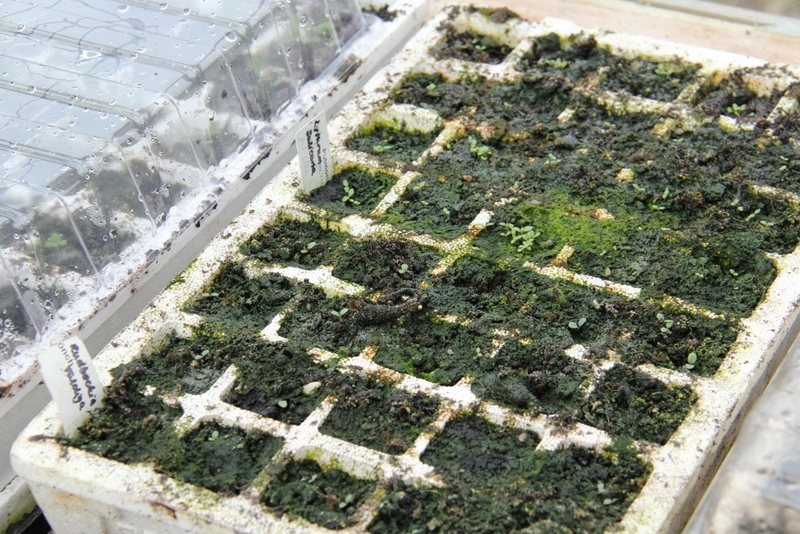 But they are in the greenhouse propagator now, so they have been growing sturdier. 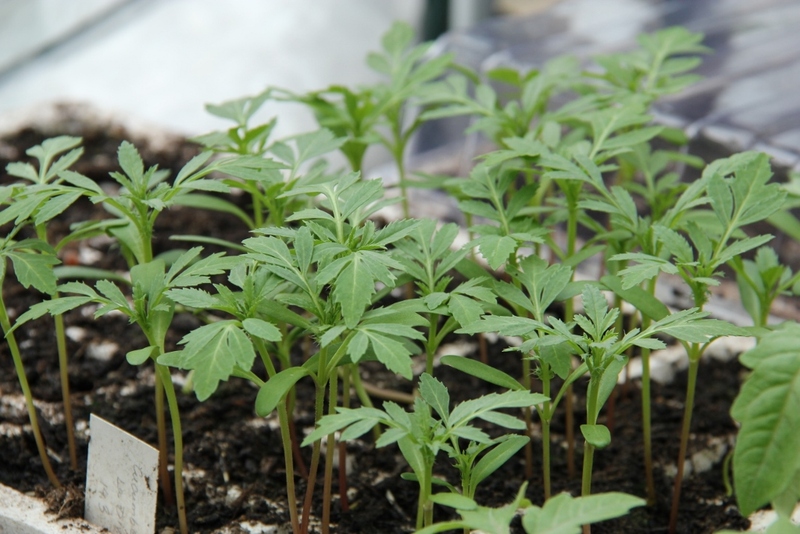 The tagetes however are growing strongly, so they should definitely produce enough dyeing material later on in the summer. 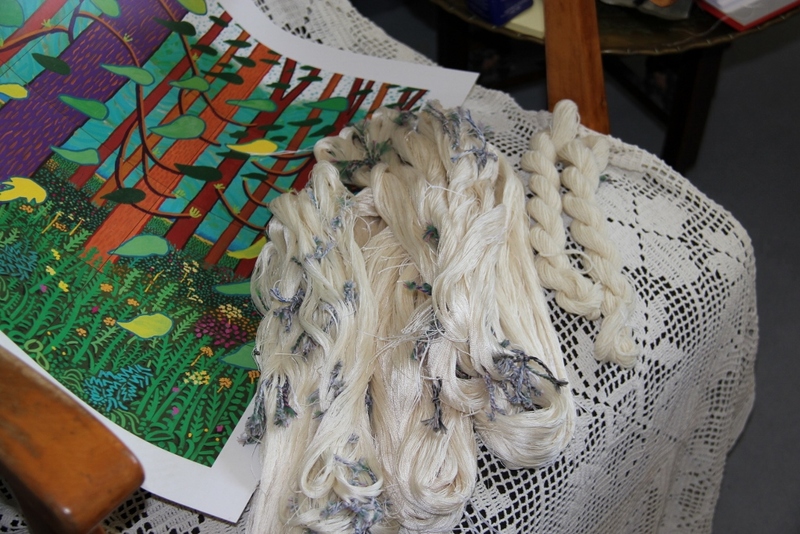 Categories: Embroidery, Growing Dye Plants, Knitting | Tags: fibre crafts, growing dye plants, knitting | Permalink. And now, after about a year of learning experiments, I am finally getting to that stage. Having practised dyeing with both natural and acid dyes, I finally have a nice collection of wool in various colours, and with my drum carder I now know how to mix many more. So what to do with all this beautiful wool? In recent weeks I have been thinking about what the next phase should be. I think it will involve some kind of picture and/or pattern making. I have been spending a lot of time taking photographs of plants and trees that I see in the garden and the woodland next to our house (you can see some of these pictures in my other blog). And although photography is a very satisfying activity in itself, I am beginning to think it would be nice to be able to interpret some of these images in a textile format, as I wrote a few weeks ago. This is a completely new area for me, so it feels pretty inspiring and exciting. I am definitely thinking I will have a go at tapestry making, but I haven’t got round to making a tapestry frame yet, so as a first, easy and instantly accessible step I have decided to try a bit of embroidery next. I don’t need to buy anything for it, I can start straight away. So this week I have been spinning some embroidery thread which has been great fun. You get to mix lots of lovely colours, and you don’t need to spin too much of any given colour, just a few grams is quite enough. I have been using Finnsheep top, as that’s pretty much my default wool for dyeing so I have it in lots of different colours. And it’s got a nice silky sheen to it, so although I originally intended to use it as knitting wool it will work perfectly well for embroidery too. There are of course lots of other types of wool that would be great for making embroidery yarn (I am thinking all those long lustre wools) as well as silk. So as ever, the possibilities are endless, but for now I am planning to stick to materials I already have. 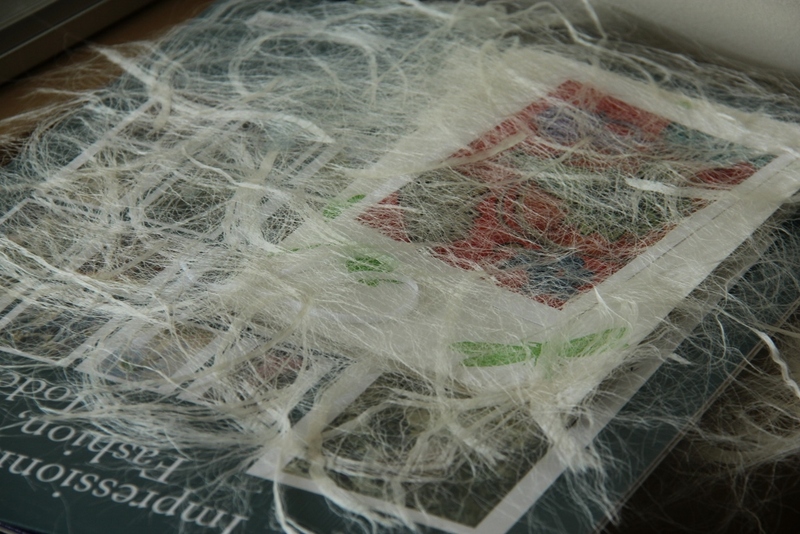 Although for knitting I always ply my yarn, when making my embroidery thread I decided not to. Strength and durability are not essential for my purposes so I don’t think plying is not necessary. And not plying means I don’t have to try to spin such incredibly fine thread, all I need to do is to spin my singles yarn the right thickness. And the lazy part of my is happy to save time by not having to ply (it’s never my favourite part of spinning). I put quite a lot of twist into these yarns to make them stronger. I tame the twist by finishing the yarn fairly vigorously, agitating it in hot water and then putting it straight into cold water, felting the wool slightly. By the end of this rough treatment the yarn will have quite a furry halo, but that’s OK for my purposes. If I wanted really silky smooth yarn then no doubt I’d have to treat it more gently. To save a bit of time, I spun all my colours into a single bobbin, joining them one after another, making just one skein with all the different colours in it. I only separated the colours once I wound the wool into little balls. 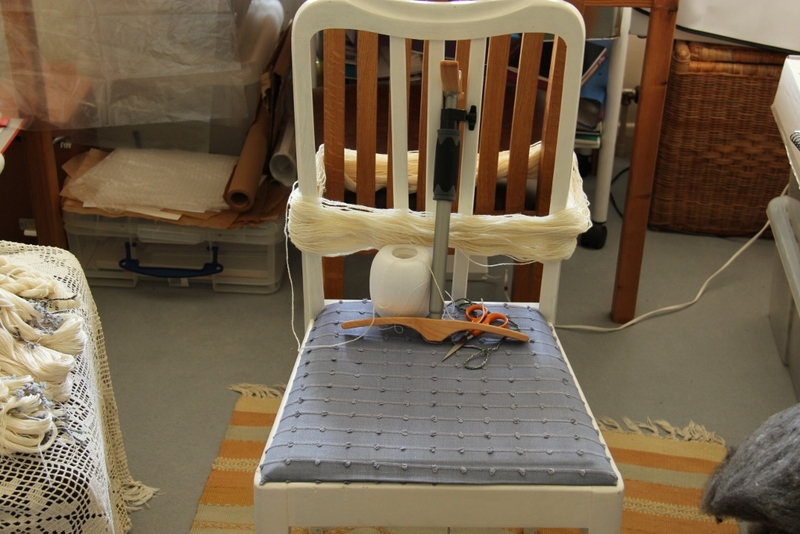 Today I have been trying my yarn and it works very well (it never ceases to amaze me that I can actually spin something that can be used!). Any extra twist just falls off the yarn when I cut it into the right length for sewing, so having twisty yarn is not a problem at all. It is a bit thick and thin in places, as my spinning is still not that good, and it does show in the sewing, but I’m not too worried about that, it just makes the line more interesting. When I first started sewing with my own home made yarn, I got that “wow, did I really make this all by myself!” -moment. It might have taken me a year, with all that learning and practising, but it was definitely worth the effort! Categories: Embroidery, Spinning, Yarns | Tags: spinning wool for embroidery | Permalink. I think we all have some skeletons in our craft cupboards. I certainly have a tendency to pick projects that are… how shall we say … perhaps a little bit overambitious. I start enthusiastically, thinking “of course I can do that, no problem”. And then gradually, over time, I grind to a halt. Here’s a picture of my biggest (and most expensive) project that is more or less permanently hibernating in my sewing box. It is my first cross stitch project, a kit that I bought in the haberdashery at the Liberty department store. I’m not normally a huge fan of cross stitch kits, but this one was truly beautiful. 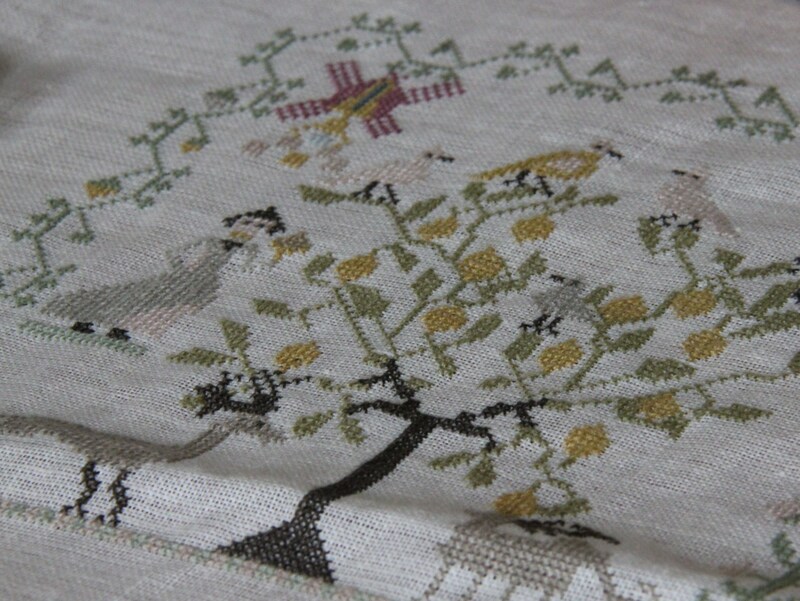 It is a pattern based on a sampler stitched by a 13-year-old girl around 1790. 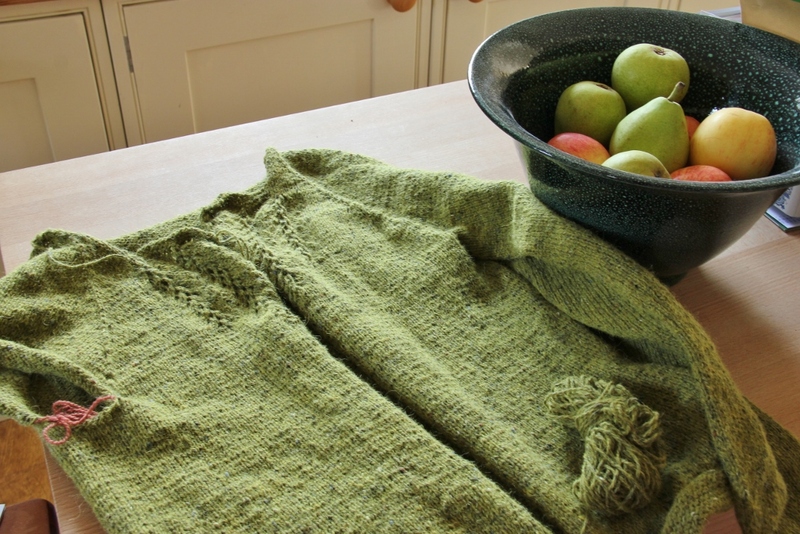 The colours, being vegetable dyed in the original, are just lovely: lots of moss greens, straw yellows, different shades of brown. It is full of flowers, animals, birds and people. Being such a big project – approx 80 cm wide – I knew it would be a “bit” ambitious, but it was so beautiful I just had to have it. When I first started it, I almost panicked when I realised what I had let myself in for. In the fabric there are no markings so you follow the chart and count your stitches. Each stitch is just two by two threads, and initially I thought my eyesight isn’t even good enough to see at that scale. I could only do it in bright daylight. But gradually my eyes got used to it and I was making some progress. Nevertheless, I was estimating that if I keep at my current rate, it would take me 8 years to finish… But the results were so encouraging, very very beautiful so I thought it would be worth it in the end, I kept telling myself. That was about 4 years ago. And then, I got ill with M.E. and just lost the stamina and the ability to concentrate enough for any length of time. Since then there has been no progress at all. Every now and then I take it out and see if I can do it again and every time it just takes too much energy and focus. 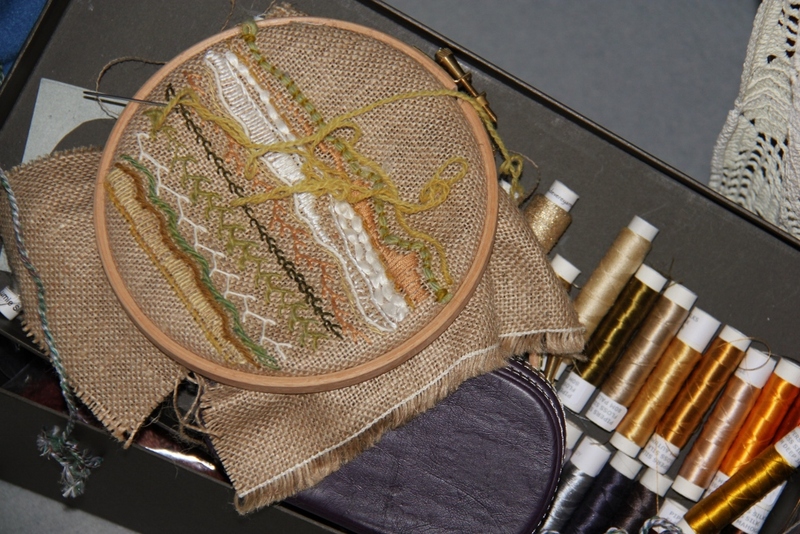 Categories: Embroidery | Tags: cross stitch, embroidery | Permalink.